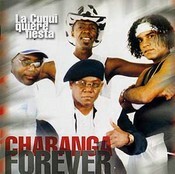 During Charanga Habanera's 6-month government imposed suspension. Juan Carlos González and Dany Lozada left to form a new band and David Calzado replaced them with singer/writer Sandier Ante, and pianist/writer Roberto "Cucurucho" Carlos.The group continued to develop new material over the next year and then, in July of 1998, an even more drastic change took place. Instead of two members leaving, this time only two members stayed -- David Calzado himself, and singer Michel Maza. 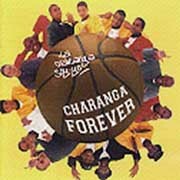 All of the rest became the very first incarnation of La Charanga Forever. 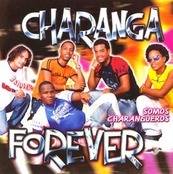 They added Armando Cantero (now with César "Pupy" Pedroso) and it was this band which recorded "La Charanga soy yo" which contains at least two songs, "El Jony" and "Se que he fallado", which were originally performed by Charanga Habanera. Ironically, by the time the album was actually released, Cucurucho and Sandier had left and been replaced by the two men whom they themselves had replaced in the original Charanga Habanera -- Juan Carlos González and Michel Maza. Thus, some of the pictures in the liner notes misleadingly show González and Maza, even though they didn't play on the album. 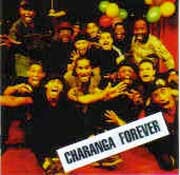 This album, then, was recorded after González and Michel Maza had rejoined the band.It has nine tracks, but the last two are Charanga Forever playing the role of studio musicians, backing a singer named Mónica Lypso. As usual there's a traditional number, "Pelotero la bola". There's also one live track, a medley of old Charanga hits -- the Earth Wind & Fire intro, "Me sube la fiebre", "Hey You Loca", "Te voy a liquidar" and "Para el llanto". Some of the coros and horns are a bit sloppy, but the energy of the live performance is captured. This leaves only five tracks, but they're all fantastic. The album begins with what the liner notes list as "Dice Formell". This song is usually called "Somos la Charanga" [audio example] and it's flat out one of the hottest Timba tracks ever made. 30 years at the top of the hit parade hasn't been enough to keep Juan Formell busy -- so he sometimes amuses himself by coming up with great musical ideas for other groups, such as the famous coro of Issac Delgado's "El Solar de la California". Next comes a great lost gem from the past, Leonel Limonta's never-before-recorded "El avión". The original Charanga Habanera used to play this in concert for years and inexplicably never recorded it. There's actually a huge amount of great material that the various Charangueros played live that never made it onto a disc and we'll have a whole article on this subject soon. Limonta's own group, Azúcar Negra, also uses portions of this song in their live show. The third track, "La menor", sung by Michel Maza was also a big radio hit for La Forever. Manuel Arranz' arrangement is full of catchy coros and mambos and Michel is perfect, as usual. "Suave pa' que" is written by Pedro Pablo and arranged by Dariel Tellez, who replaced Arranz in the course of the recording of the disc. Arranz is now in South America and Tellez has reported just joined Paulito FG. Sombrilla is in fine form here. The fifth track, "No llores más" by González, sounds good enough to be from Tremendo Delirio or Tanto le pedí. In summary, then, this album has five stellar tracks that are essential to any fan of the original Charanga Habanera, one of which is pretty much indispensible to anyone with a pulse. Think of it as a killer EP with a live cut and three other bonus tracks. I recall reading somewhere on the 'net that the album sounds as if it were put together in hurry, but this is not the case with the opening five tracks, which are all top quality Charanga brilliance in every way. By 2004, only Vitico, Polledo and Sombrilla remained from the original group, but an influx of young talented resulted in an excellent album which is in many ways one of the most exciting timba albums in recent years. Another solid Envidia release with guest vocal appearances from Tirso Duarte and Michel Maza.